This is a 35 hectare patch of woodland including the villages of Boabeng and Fiema, which are about a mile apart. This monkey sanctuary has no fences, the monkeys are here because they want to be. There are two types the Black and White (Geoffroy's) Colobus, and smaller Campbell's Mona. 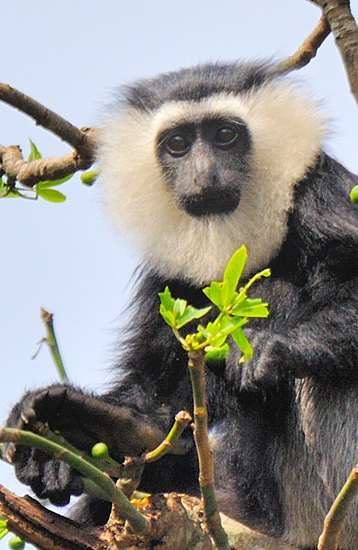 The Colobus live high up in the trees eating just leaves while the Monas are at lower heights, eating a wide variety of food, including that brought by visitors. These smaller monkeys that travel in troupes of 15-50, come down to take food like bread and bananas from the hands of visitors. On my visit, sat a number of the black and whites high up, but in range of my lens, and three troupes of Monas that I was very close to. Sometimes too close to focus. There are said to be around 500 Monas and 200 Colobus monkeys, that form 13 troupes within the sanctuary area. There have been sightings of Green, Patas, Spot-Nosed and Diana monkeys, but probably not resident populations. In this small area the monkeys are protected and treated as sacred, so they have become used to being fed and looked after by village people and interact with them. The guides make a noise which the Monas come in response to. 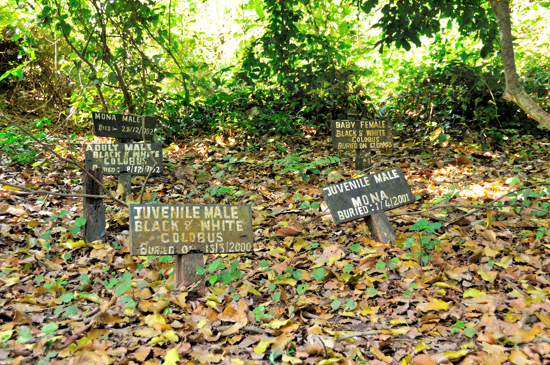 There is also a graveyard where monkeys and priestesses are buried together that visitors are shown. treat the monkeys as relatives. Dawuro asked the hunter to take the calico home and when he did, that the monkeys followed him home. With time the number of the monkeys increased and the fortunes of the hunter also increased. The hunter attributed his improved material condition to his association with the monkeys and this led to a symbiotic relationship that has persisted to this day. Any monkey that died was buried and funeral rites held for it just as human beings. Another settler came to settle in nearby Fiema. He was also in contact with a spirit being called Abodwo. Because the spirit beings lived as neighbours they got married, according to the folklore. The physical representations of the marriage were the monkeys. Daworo is said to have given some of the monkeys to Abodwo to take them as its sons. 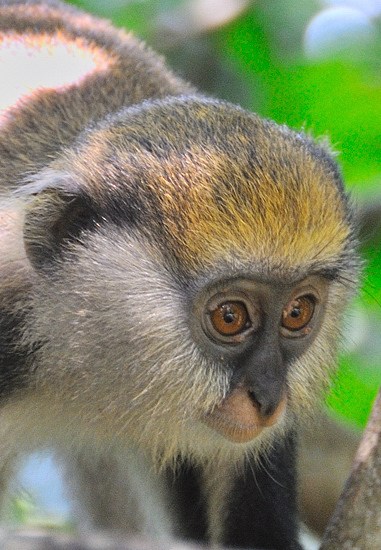 Although there are now local laws protecting the monkeys, however, according to the legends of the area, who ever kills a monkey suffers a calamity. The story is told of a man, who killed a monkey in the 18th century and all his relatives died one after the other soon after. People of Boabeng-Fiema observe Fridays as special days for the monkey and do not go to the farm. Getting there: From Kumasi take the road to Tamale until you reach Techiman (about 100km from Kumasi). From Techiman take the road to Nkoranza. In Nkoranza you can ask for directions to Fiema. The road soon becomes a dirt road. When the road splits, the guest-house and park office are found on the left.